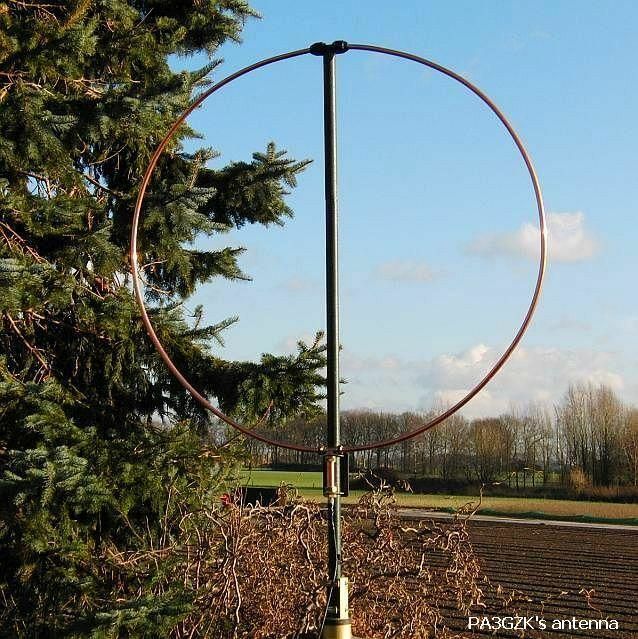 WebSDR Weert (NL) use this active loop antenna. Left my green coloured loop as distinctive "bush" in my garden and on the right in PA3GZK's garden his trial model as described in this article. A different design is currently being experimented with and this is one example. 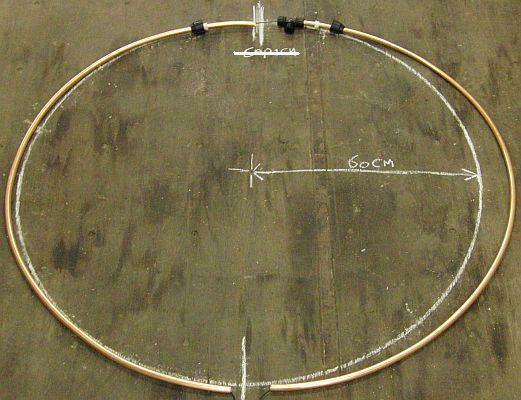 “Tonight I made the loop Amp as it is published on your site. I had still a number of new RCA 2N5109s from the 70s! 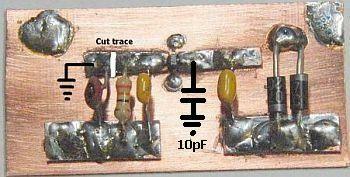 The amplifier performs well, also at the low frequencies, on 100 kHz it is two S units stronger than my old BC design. Above 3 MHz to 15 MHz, the gain increases even more and should actually be lowered slightly according to the S meter. In contrast, all stations are bomb hard. The S/N ratio seems goed, it works better than with the INA amplifier. The reception from 500 to 50 kHz is simply super and can compete with an expensive long-wire antenna. The loopl (130 cm) is approximately 4 µH with one turn as the internal conductor. When I install a second winding (double loop) it is close tor 10 µH and the reception in this range is even better and the reception of the BBC is 198 kHz over S9. You can you hear all the beeps and whistles beacons below 100 kHz. I am planning to use a relay for switching one or two turns, because it is really worth it!”. The gain increases on the higher frequency is probably because the inductance of the 1 ÷ 1 transformer (balun) is to low for the lower frequencies or the coupling capacitor parallel to the 390 ohm resistors should be 100 nF. In reality it is almost straight to 350 MHz. A couple of different amplifier designs is currently being experimented with and these are some examples. The test are done with bare loops, but is intended for a shielded loop. May be a better transistor (2N3904, BFG541, or BFG591?) can be used, but a 2N3866 was on hand. I have used the single transistor settings a lot in all kinds of experiments or designs because the gain is straight from 1.8 MHz to 30 MHz when the input and output are loaded with 50 ohms. The right-hand system is a version of a cascode circuit. 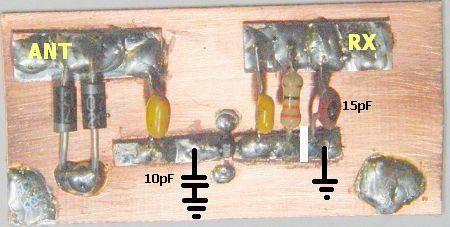 The second transistor does not work in grounded basis circuit but with a RF grounded emitter. So far I prefer the right-hand circuit: very low input impedance, stable, simple, wideband up to 70 MHz and not too many components. It is actually a clone of a simple "cable TV amplifier". Other efforts were done with the INA02186 because sometimes instability occurred and the gain was too high. A resistance at the input makes the load on the antenna more constant. A 220 ohm resistor in the power supply contributes to the stability and the impression exists that the noise level has decreased. Perhaps the amplifier oscillated slightly and caused the unwanted noise. With the combination 330 pF and 4.7 Ohm the gain gradually decrease after 15 MHz and the resistors 47 and 150 Ohm further reduce the level, but this is my choice. If you want a different gain, you can that set with a 220 potentiometer. It is also possible with a "normal" attenuator. A («fig) coupling with a toroidal core has also been tested, but despite testing with various transfer ratios, the signal strength result was less than with the direct coupling. If one has no place for an antenna of sufficient length for receiving radio signals, a small active antenna may be the solution and you may find on the Internet a lot of related publications. If you want a system that is able to reduce or suppress interfering signals, most articles are not appropriate! The following design has that noise cancelling quality, you can confirm it by listen to MP3 files later in this article! 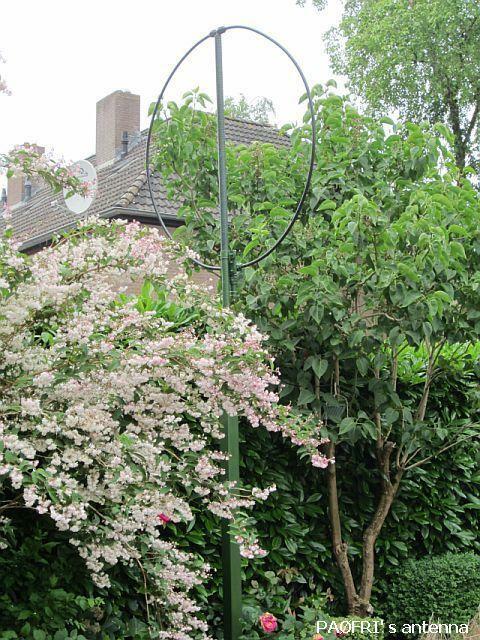 PA3GZK has built quite a number of active antennas in various forms and he experimented extensively. 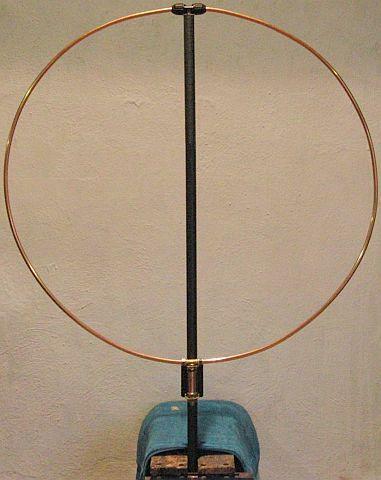 The antenna described here (fig ») gave by far the best performance and it was the final result of many tests with various circuits and systems. For a properly functioning antenna, and a substantial symmetry of the system, it is recommendable to follow the mechanical construction as well as possible. For me, the reception decreased the interfering noise especially in reduced interference on the 160 and 80 m bands. Other hams have also found favour with the system. Someone about 16 kilometres away could not listen on 80 m, but he was a returned SWL with an antenna made PA3GZK. Because in practice the antenna worked well with a current of 30 - 40 mA, a controllable voltage was waived for a constant current supply. 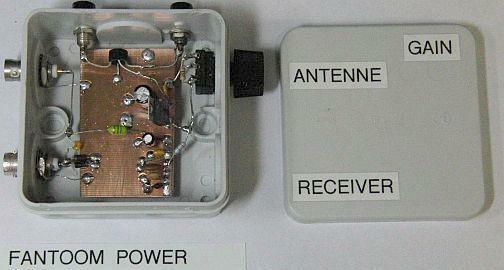 The circuit is simpler and if a short circuit occurs in antenna or coax feeder, there is no big problem. The proposed shielded broadband (~200 MHz) active loop antenna offers more quiet and relatively less interference reception. It is known that an antenna for transmit also works well as a receiver antenna, one only forget that all interference signals are proportional strong. Therefore PA3GZK believe that you actually have to use two antennas, one for transmit and one for receive. The latter is most needed at the lower frequency bands. 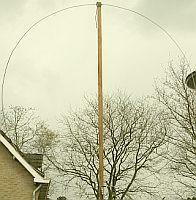 This antenna is much less affected by fading (QSB) as a dipole or other similar antennas. The E-field in the near field that causes the most interference is very well suppressed, because the antenna within this field will primarily responsive to the H field. By turning the antenna the interference can be almost zero suppressed without losing the desired NVIS signal. With DX signals, there is a directional sensitivity established. Compared with a reference antenna the loop has a one S point decreased reception on average. 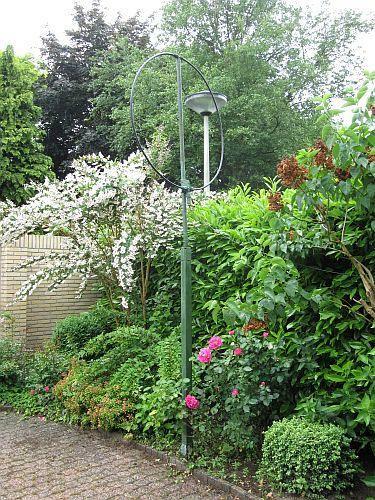 A classic 80 meters Zepp antenna was used as reference at a height of 20 meters, while the loop was mounted on a 2 meters pipe. With active antenna the signal to noise ratio or signal to interference ratio was much better, listen to MP3 files in this article. 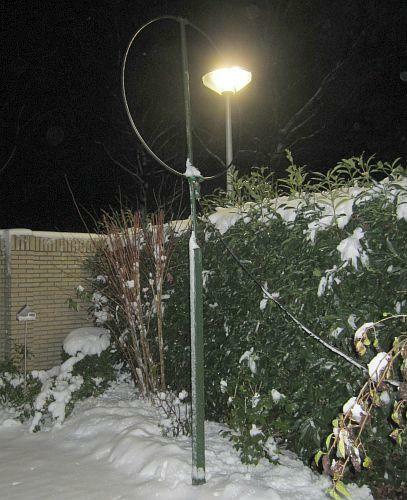 The 120-cm diameter is in practice a proven compromise between desired signal and reduced interference. A larger or smaller model is disadvantageous for reception or the extent to which the strength of interference decreases. I have not encountered the recommended maximum size in other publications. Further showed that leaf touching the antenna has no appreciable negative impact on the operation, so hang or camouflage in a tree is not a problem. 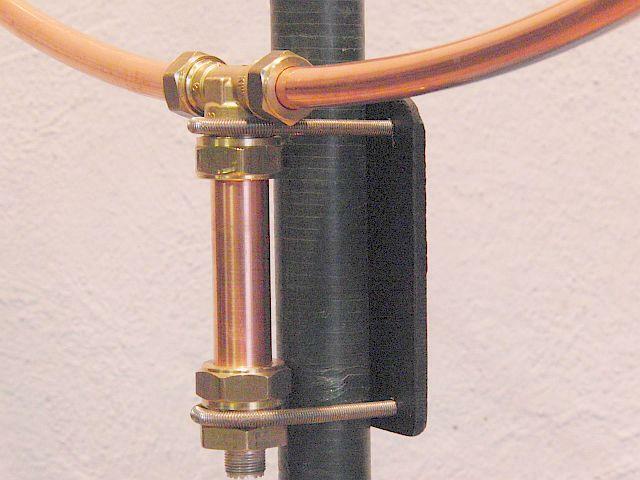 The antenna is built with 15 mm soft copper tube and is designed as shielded symmetrical loop. This was done in order to minimise the disturbing influence of the surrounding conductive objects such as, trees, fences and gates, as far as possible. During testing with previous structures and models, it occurs that a slight disturbance of symmetrical construction affects the degree of noise suppression. The active loop antenna can be installed close to a transmitting antenna without a problem. PA3GZK use the transmitting antenna 4 meter away from the receiving antenna, which is still intact despite sometimes 1 KW transmitter power. PA3GZK did the test with a Kenwood TS-480 tuned to the 80 meter band and the noise signal from a farm about 500 meters away. 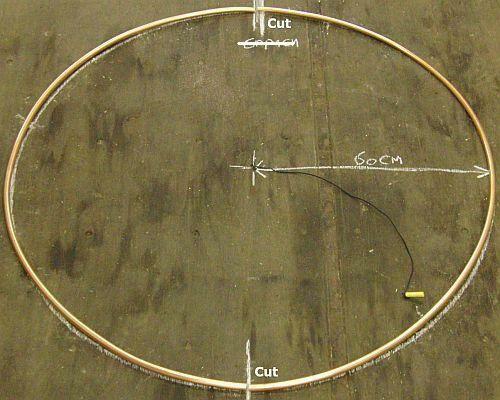 The recording is switched between a 80 meter Zepp antenna or a magnetic loop antenna having a diameter of 3.7 meters. The active loop antenna was rotated such that the interference signal was suppressed. The sequence was: the first 10 seconds Zepp - 10 sec. the big magnetic (transmitting) loop - 10 sec. Zepp - 10 sec. active loop - 10 sec. Zepp - at last active loop. Click on MP3-1. The next test is about the difference between ZEPP and active antenna. PA3GZK switched several times between the two antennas. Click on MP3-2. In this test, you will hear the difference if the active loop is directed or turned from the "jamming" source at about 500 meters distance. Click on MP3-3. All tests run in the Dutch language. IC INA-02186 has now become "vintage" and readers mailed that more modern types are on the market. However, PA3GZK has experienced the successors are not as well resistant to overloading. The IC is still offered via eBay. Dave Bunyan found on eBay a ready built amplifier board and when he looked closely at the photos of the MMIC on our board and compared it to the MMIC on the ready made board they both appear to be the same - the MMIC showing the number N02. He wrote: "The gain/frequency curve on eBay ad is identical to that on the INA-02186 datasheet. The complete PCB (5.2 × 2.4 cm) may be of interest to you and others who might want to try the loop. Adding the protection diodes and the 10 pF capacitor at the input and the 15 pf capacitor on the output should be easy to do. For powering up the coaxial cable an RF choke between the Vcc and the centre pin of the sma connector would work - I hope without instability - and SMA to F connector adapter for the output". It has taken me a long time but I have finally got a working model of the shielded magnetic loop. It uses the board available from E-bay. One important difference. 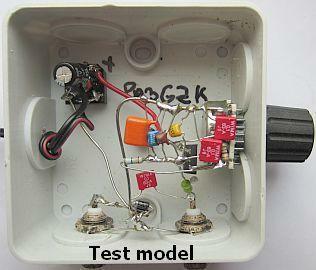 I am using a 1÷1 balun wound on an BN-73-202 core. This is mounted on stripbroad and has a male sma PCB connector on it to make connection to the pre-amplifier easy. Results are very impressive - I cannot do a proper comparison - but I was listening to clear CW signals from DK1 and DF1 on Top band this evening. When I was G4XHN (1983-1988) I could not use top band it was so noisy. And I heard JK1P in QSO with a Portuguese station on 80 m. A short dipole fed through coax gives much poorer signals - but is all I had for short wave/medium waves. The loop gives good signals in the LW broadcast band, without changing the input capacitors - which are 100nF - the same value in your circuit diagram. It works quite well in the FM Band - I will be testing it on 50 MHz and the 66-74 MHz Russian FM band when the Es season start. The loop feeds an SDRPlay RSP and I have had to fit a 10dB attenuator before it. 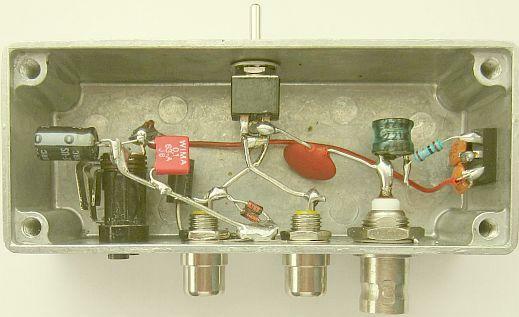 Without the attenuator there are inter-modulation products even with the gain turned right down and the LNA turned off. Thank you for publishing the article. (PAØFRI) This PCB is from another supplier found on eBay. The generator level at the input of the amplifier was - 26 dBm (S9 + 50 dBm). It is unlikely that such a strong signal is ever received by the antenna. The generator level at the input of the amplifier was - 36 dBm (S9 + 35 dBm). It is evident that only a very strong signal is able to overdrive the amplifier. The components are installed with the Manhattan system, ie the solder islands are glued PCB strips. In previous schematic 330 ohm resistor was 240 ohm. Sometimes the IC was oscillating with short coaxial cable, therefore the resistance was increased and IC's supply voltage was reduced to 5.5 volts. It will be clear that this supply is outdated by the simpler supply earlier in this article. The INA 02186 has a high gain and a good connection to ground is essential. Some home brewers had to deal with an oscillating amplifier. To prevent instability ensure that both lips have direct contact with each other via one track. Do not separated by a machined groove, but solder on the same "island" or track. It turns out that adjusting R for the least noise is the best and not for maximum S-meter reading. Signal-to-noise ratio is then optimal. Here the circuit is powered by 13.8 V. If the meter is turned too far, the system oscillates and a strong noise occurs. That stops when R is reduced again. My best result is achieved when R is set for about 30 mA from the 13.8 V power supply. 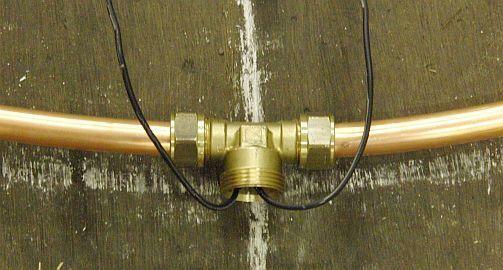 Soft copper tube 15 mm in length 4 meters. Brass T piece 15 × 22 × 15 cm compression fitting. Brass end cap 22 mm compression fitting. Copper tube 22 mm length 15 cm. 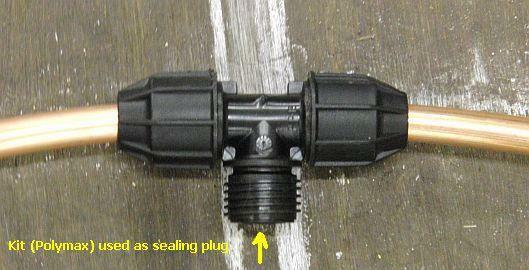 Plastic T piece 15 × 15 × 15mm. PVC or polyester tube 32 mm length 160 cm. Trespa board 6 mm × 13 6 cm. Stainless steel threaded rod M6 4 nuts and washers. Except IC and PL chassis one can obtain the other items in a regular hardware store. For keen DIY's the following pictures will be clear enough to construct the antenna successfully. The previous design was build with a thick coaxial cable, but the present construction is easier to assemble, and the various mechanical components are standard. The 15 mm diameter soft copper tubing (from a hardware store) is 4 meters long, actually there are two easy to bend pieces of 2 meters. The "bending track" is marked with a crayon and a piece of rope. The plastic T connector, who is mounted on the standpipe, is sealed with suitable kit such as Polymax to avoid any water leakage or condensation. The flexible insulated wire does not need to be concentric. 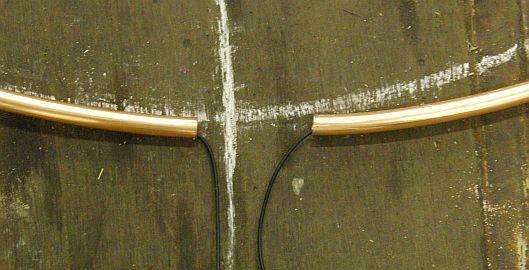 Slide the amplifier in the 22 mm-copper tube. Solder the mass of the PCB with a suitable soldering iron on the inside of the tube. Also use that point for one side of the flexible wire. Solder the other side of the wire to the input of the amplifier. Solder both sides of the PCB to the («fig) inner side of the tube. Start with soldering thick wires to the tube and then solder pcb to the wires. In previous models more components of plastics were used. 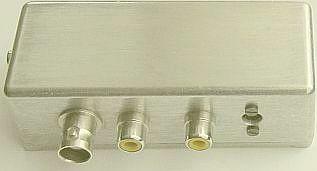 The outer jacket of the coaxial cable worked as antenna for the transmitted signal and thereby upset the operation of the IC amplifier. In order to suppress a choke balun was installed. In the here presented model the choke is not been necessary. However if any instability occurs a cable suppressor may be used. The active antenna oscillated regularly in combination with my current IC-7300. It turned out that the tripod stabilizer was one of the culprits. The setting for a more stable behavior was with 30 mA current and that had previously been determined several times. Therefore, another power supply was made where the supply voltage for the antenna is constant despite the supplied voltage and the current is set to 30 mA. If you work with a fixed supply of 13.8 V, you can use the simpler schematic («fig) on the left. Below is a selection of the experiments with this design. The above information must be sufficient to DIY. In the extreme case of having a problem please contact PA3GZK via email: pa3gzk@amsat.org, but limit the email traffic as much as possible! He still receives questions that could have been prevented by reading the article carefully.